Imagine if you didn’t have to tell your appliances what to do… because your phone could do it for you. This is the concept behind six new models from the Titan range of washing machines, featuring SmartThinQ technology. LG Electronics is introducing a new way to give homes an IQ Boost with a brand new smart appliance range. Most consumers have heard about the success of one of last year’s most sought-after appliances from LG, the Titan washer and dryer in one. Now, the brand’s newest launch is building upon that success. The 2017 Titan range will feature four new models in two elegant finishes – stone silver and luxury silver – with different sizes, door designs, and features. 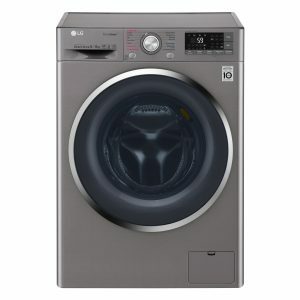 “Of course this will include the Direct Drive inverter and True Steam™ technology for optimal washing, which both made their first appearance in the original Titan,” says Sulette Jacobs, Home Appliances, Product Marketing Manager at LG Electronics. “Additionally, the new models each come with their own set of value-enhancing technologies, like Turbowash and Smart Diagnosis and NFC, which enables a consumer to download a cycle of their choice from their mobile smartphone to fit the needs of their family. This innovative smart home technology allows consumers to connect via WiFi to the new Titan models. They will then be able to select and initiate a wash or dry cycle, from anywhere, at the click of a button, using the LG app on their smartphone. That’s right, discovering old musty forgotten clothes in the washer is a thing of the past, now that laundry can be managed virtually.